Pretty pink 1-inch badge with a romantic feel. If you're feeling romantic or loved up this would be a cute badge to pin to your coat. 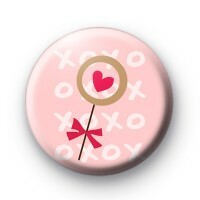 It is a light pink badge with XO pattern and a love heart. heart. It is a nice badge to use in your Valentine's crafts or give as a handmade token of your love on February 14th. With hundreds of love, romance and soppy badges in the shop we are confident we have the perfect badge for you.